Grilles & Screens | Willard Shutter Company Inc. The EconoSpan® louver and screen system is a continuous, “free-standing” louver product comprised mainly of roll formed louvers that snap firmly onto “double-gripped” stringers or posts installed on pre-determined intervals. 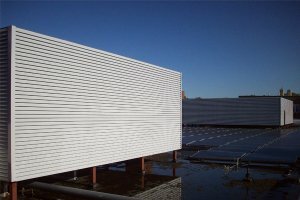 This system is ideal for roof top equipment screening or other applications with large areas requiring concealment and ventilation. It is available in two major styles: Pitched Louver (both 45° and 22-1/2° pitches) and Flat Picket (both horizontal and vertical orientations). Along with being very attractive, it is also one of the industry’s most affordable systems. Using standard production components, the EconoSpan® system is designed and manufactured as required to be installed on a supporting structure. This allows the supporting structure to be provided locally, based on local code requirements*, yielding further cost savings. This simple “knock-down” product design allows it to be shipped as a kit in relatively small crates with step by step installation drawings making it convenient, simple and relatively quick for general contractors to install. 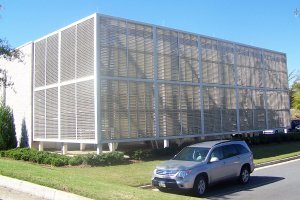 The all-aluminum Islander® Screen system is comprised of modular louvered panels assembled to order, and affixed to an existing substructure to form an enclosure. 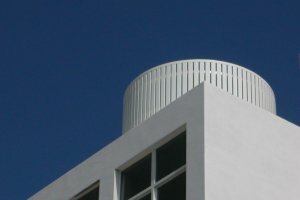 The Islander® system is constructed using 1-3/4″ roll-formed louvers, and roll-formed frame components reinforced by an internal extruded aluminum I-beam. Panel sizes are calculated and manufactured to various shapes and sizes according to customer requirements, and ships with complete shop drawings & installation details. This simple system design allows for convenient shipping and quick installation. The appearance of the Islander® Screen features a traditional, open louver appeal. It is a very low-profile system – only 1-5/8″ thick, and is widely used where a “more aesthetic, less commercial” look is desired. 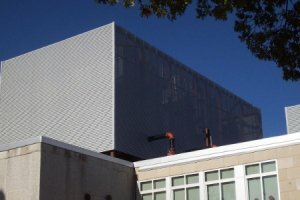 The relatively small louver and tight spacing make it virtually sight-proof, and good for locations close to pedestrian traffic. The product is available in a range of standard colors allowing for quick delivery. Custom color powder finishes are also available upon request. *Code standards vary by State, County and Municipality. Willard Shutter does not assume responsibility for interpretations of local building codes. It is the responsibility of Contractor / Builder / Owner to provide specific wind load requirements and/or additional engineering guidelines and code requirements to Willard Shutter Company prior to manufacturing. This information shall be factored into and become part of document drawing sets, and product shall be provided accordingly. Contractor further assumes responsibility for supporting structure as well as final installation in accordance with Manufacturer’s Instructions and Drawings provided.